Walter Clyde "Puggy" Pearson (January 29, 1929 - April 12, 2006) was an American professional poker player. He is best known as the 1973 World Series of Poker Main Event winner. Pearson was born and raised in Tennessee in a family with nine siblings. He got his nickname "Puggy" from a childhood accident that left him with a disfigured nose at the age of twelve. He dropped out of school in the fifth grade, and at the age of 17 he joined the United States Navy, where he served three terms. He strengthened his skills at poker and gambling while in the service. Prior to 1949, all poker games were cash games; a player could cash out his chips and leave at any time. Pearson originated the idea of a freezeout tournament and shared his idea with fellow gambler "Nick the Greek" Dandolos in the early 1950s. Dandalos later brought the idea to legendary casino owner Benny Binion. After further urging by Pearson, Amarillo Slim, and Doyle Brunson, all of whom felt that such a tournament would create great side (cash) game action, Binion founded the World Series of Poker in 1970. Pearson won the 1973 World Series of Poker (WSOP) main event when his A♠ 7♠ defeated Johnny Moss's K♥ J♠. He won four bracelets, two of which were in seven-card stud. Pearson was known as a man who would always seek out the biggest game in town, whether it was in the poker room or on the golf links. He even owned a RV he called the Roving Gambler, with this painted on the side: "I'll play any man from any land any game he can name for any amount I can count, provided I like it." 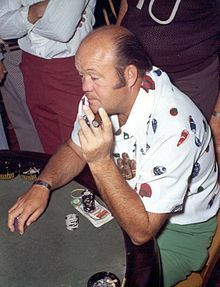 Pearson was inducted into the Poker Hall of Fame in 1987. Pearson, who had a long history of heart problems, died on April 12, 2006. It is thought the cause of his death was a heart attack.